You spend a lot of time around your coffee table and so it’s important that this not only reflects your personal style, but helps you to create a living room that you feel good in. If you’re still developing a personal style for your home, your coffee table provides the perfect palette for experimentation. 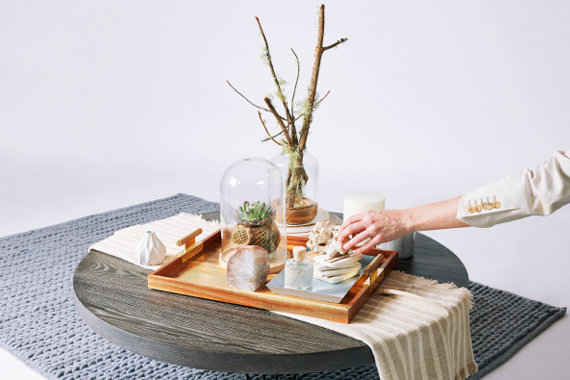 Here are three ideas to play with to develop your signature coffee table look. Mix up the size and scale of the objects on your table to create a visually compelling array. Start by building a base from bigger items. Coffee table books are perfect. Because they tend to be highly visual, perhaps art, design, fashion, or photography books, they also create a point of interest on your coffee table. Experiment with building stacks of three to five books on your table. Next, consider what you could place on top of the books. Don’t be afraid to add elements that play with height. Candles are an excellent way to do this, while adding depth to your coffee table. You can display squat or thicker pillar candles without a holder, but thinner candles or tapers will need a candlestick. You could add a vase of flowers, but plants are a great and longer lasting way to demonstrate your personal style, while adding a pop of greenery to your coffee table. Consider the colour and style of pot you’ll use, and don’t miss the opportunity to add a little extra texture. Once you have a base of items in place, it’s time to make the table uniquely you. This means considering which personal objects you might add. Mix up objects that are there for decoration with those that have meaning and significance for you. If there’s a photo of someone you love, or the whole family, consider displaying it in a brass or antique frame. If you’re having a hard time finding things you love, or you have things which are too precious to pop on display, head to a vintage or antiques fair, or a flea market and shop for trinkets. Look for items which have resonance for you, and will look great on display. Next, consider unusual ways to show them off. For example, an eye-catching necklace might look great nestled inside a vintage glass or jar. Objects can also be more effective when you display them in multiples, so look for items which you can buy more than one of, to group together. As well as your treasured things, your coffee table will also hold a selection of functional items. Without being organised, this can make your table appear more cluttered than you would like. We love trays because they let you not only keep a little clutter, they make it look good. Grab a tray or two to arrange all the bits that you need- perhaps remote controls for your television, matches for lighting your candles, a tube of hand cream, or even a few snacks. If you’re using more than one tray, play with the shapes and sizes to create variety.